Campanola is the Citizen luxury watches series. Introduced in the year 2000, it offers unique watches assembled by exceptionally skilled craftsman. The series has the feel of a collector’s timepiece, delivering a number of desirable complications, using a high-quality analog quartz movement. Citizen is known by its mass production products, but it’s also able to produce luxury watches that stand out due to their innovation and craftsmanship at a relatively affordable price. 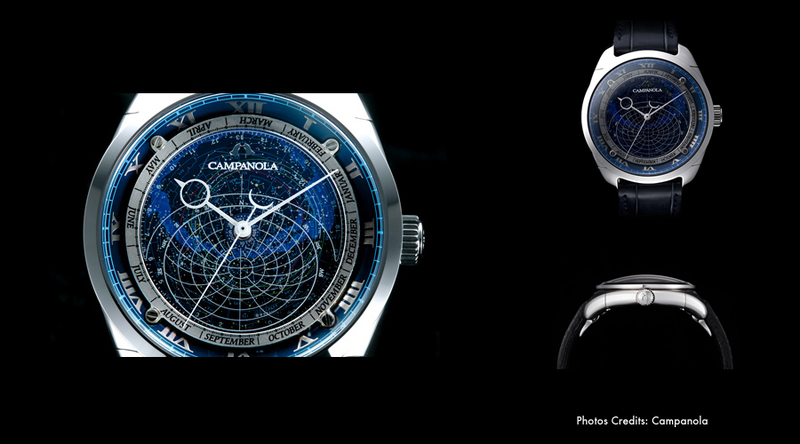 The Cosmosign (CTV57-1231) is a superb watch from the Campanola collection dedicated to astronomy enthusiasts or anyone with a passion for the skies. Within a beautiful craft 44 mm diameter glass-and-steel case, 1,027 stars, 166 star clusters and nebulas from the Andromeda galaxy and Orion’s belt are laid against the watch’s face, forming the celestial sphere as observed from 35 degrees north. It’s not just for display, though the watch actually shows you the correct positions of the constellations as they move across the cosmos, it also features calendar functions and sun and moon position charts. The Cosmosign features a high quality analog quartz movement caliber 4398, with an accuracy of ± 20 sec/month and a water resistance of 3 atm. The price tag for this watch is 241,500 yen in Japan, which is about $ 2,371 USD. Although not cheap, this watch is indeed an affordable choice regarding the number of complications and its’ quality.